Jatashop is your one stop home decor store. Whether you are looking for a small crystal figurine or a large piece of furniture, you will find it here. Choose from a huge selection of home accessories, home accents, home furnishings, and furniture to enrich and highlight every room in your home & garden. Our goal to our customers is to provide selection, quality, value, and great customer service. Our home decor features rustic, wildlife, western, contemporary, southwest, whimsical, and modern styles. Rustic Decor - Rustic decor comes in many different styles including Southwestern, wildlife, primitive, country, cottage, cabin and western. Rustic decor brings the essence of the wilderness into your home, cabin, lodge, or ranch by adding that feeling that you are at your favorite outdoor getaway. Decorating with rustic decor will make a home feel comforting. You can decorate your kitchen, living room, dining room, bedroom and even the bathroom with our extensive selection of rustic furnishings. Shop our rustic home decor, home accents, and home accessories. 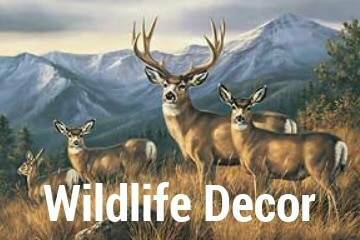 Wildlife Decor - Based on nature and the wilderness, wildlife decor can be used to decorate your home, cabin, lodge, log home, or cottage with wild animals, fishing, hunting, the great outdoors, and many more outdoor themes. Our beautifully crafted wildlife accessories, accents, and furnishing are perfect for any nature lover and make it easy to express your love and passion for nature and the great outdoors. 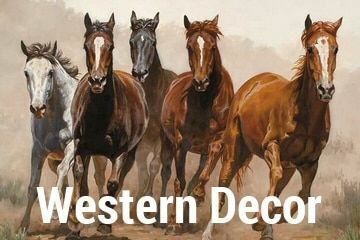 Western Decor - Western decor will add a unique country western flair to each and every room in your home, ranch, or barn. Decorating with western style home furnishings, accessories, and accents is perfect for anyone who loves cowboys, horses, the old west, the Wild West, Texas, rodeos, and the great outdoors. Create a cowboy or western environment when you furnish your kitchen, bathroom, living room, dining room, and your fireplace with high quality western decor. Contemporary Decor - Contemporary decor will provide exceptional style and design while creating an elegant ambiance in the home. Home accessories, home accents, home furnishings, and lighting can be used to decorate and create an elegant and relaxing environment while keeping current with the newest styles. Furnish your bathroom, kitchen, dining room, living room, and fireplace with our selection of contemporary home decor. A home that is decorated with contemporary furnishings and decor creates a comfortable, yet sophisticated feeling. 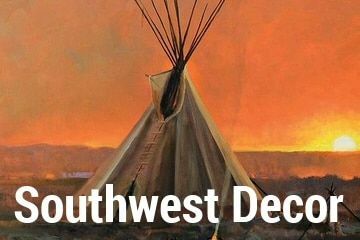 Southwest Decor - Our southwest decor offers unique designs and vibrant colors for your living room, family room, bedrooms, bathrooms, kitchen, and the walls in your home. Decorating with southwestern furnishings provide warmth, style, charm, and complete your decorating scheme with a Native American flair. Southwest home accessories, accents, and furniture provide quality, exceptional style, and create a unique and cozy ambiance in your home. Whimsical Decor - Whimsical decor is a fun and unusual way to decorate your living space. It allows you to create an entertaining and exciting theme in a room, or in the entire home while adding a little light-hearted humor. When decorating with whimsical decor, it will put a smile on your face and cheer up and brighten the room with a fantastic feel.